I found this cage at a Petsmart and am intrigued. Has anyone else used it? Thoughts? for that price you could buy a 3 hole stacker cage with duratrays in Michigan!! Not the best style of cage to keep rabbits clean and too much money in my opinion. If you found it in a petsmart store it doesn't really require clicking to say it's pointlessly overpriced and likely breaks easy...... If all that is plastic it has a short lifespan and at minimum the base is plastic. It will break in the cold or with long term sun exposure and any clips or so forth are always having issues. Anything not solidly wood or metal is really overpriced for what they save by making less durable plastic forms. Sure it works well indoors and for awhile outdoors while being easy to clean but there's a reason wood hutches are often used. We really haven't made anything but high quality, coated steel that handles the outdoors as long as properly handled wood does. You can get lots of mini chicken coops and rabbit hutches of wood with pens or separate pens that are easily modified to stay against it for equivalent. 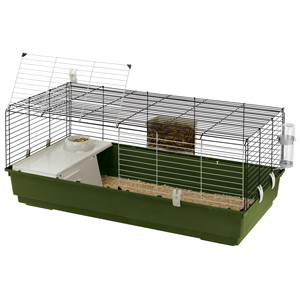 If you don't want the typical wire rabbit cages I'd either look at local all weather outdoor mini coops or rabbit hutches for that purpose or if you want something along the small pet cage lines that is very adaptable for indoor and outdoor setup you can't beat a section of midwest ferret nation ($129 currently on sale $97 with free shipping from ferret.com) if you want the stand for indoor use and set it on the ground outdoors or just get an add on unit without stand ($100 on sale for $74) to set outside and grab a pen for about $60-$80 (I think midwest sells their common ones about $80). Used the things are even cheaper and show up on CL sometimes. Actually I've got 4, 2 level ferret nations for $100 of the old screw together kind because someone inherited a storage shed full of them. We use them like legos lol Aside from building a variety of floor pens, split introduction areas, and even a stand to hold my heated bug cultures for the cleanup crew of the reptile enclosures I also have some spliced together with metal brackets to make 6' long cages instead of the 2x3' modules. The panels have sat outside after rinsing for weeks including right up through snow storms this year and not a mark of rust on them. Some of the screws we have replaced as a little rusty but newer models are all snap together and I'd just suggest a rubber mallet for some tapping to avoid damage when they don't like to slide together perfectly. We just knocked the side panels back into one of the 4 unit 6' long ones we made because our chinchillas got a bit numerous with extra large litters the past year. They come with plastic shallow pans but bass equipment has a ferret pan section specifically sized for midwest cages with a few more durable options and higher sides or one cage we got someone just drilled plexi panels to attach them and lined the cage with them to make an 8" high box. 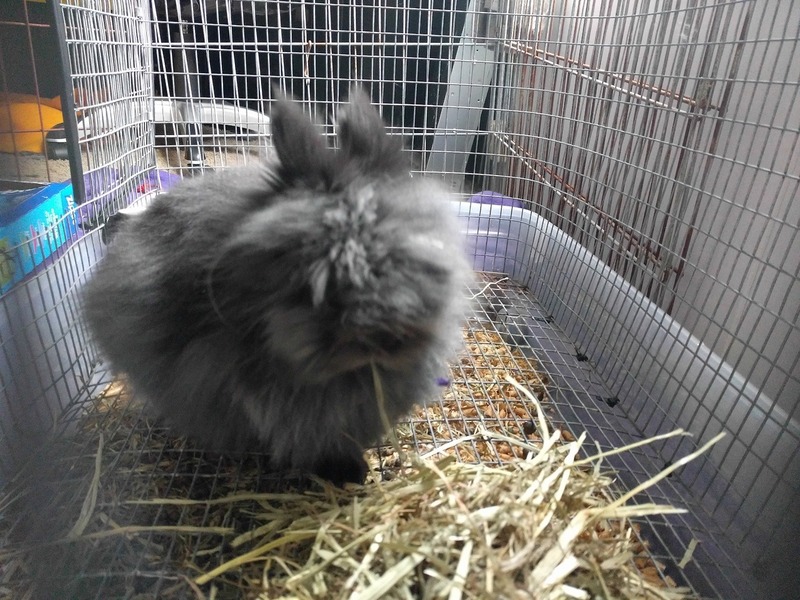 I am not a breeder I only have the one rabbit and she is an indoor rabbit. So I don't need a 3 hole cage and exposure isn't a concern. The part that I am really wanted to know your thoughts on is the attached pen. In that case BunnyChild... you really need to goto a local show of find the local cage builder.... you can get something similar, larger and better for the same price. The wire enclosure looks too flimsy.. I have rabbits that would pick up wire like that and carry it.. or just move it for fun. Although I have used the plastic bottomed pans when space gets tight ... I don't like them.... The rabbit can easily be laying in its own mess... this to me isn't a very nice way to live, but would work if you can clean daily. Good luck with your cage hunt and I do encourage you to ask a local cage builder if they can make something similar with a pan and wire bottom for the main cage and a removable fence area ... I think you would be happier with that product! or like this, where the rabbit is on wire, but the "litter" pan is incredibly shallow and at least in the case of my rabbit, he will pee in the corners (as they usually do) and it will just shoot out on the floor. neither of these were gonna work for me. so i built my own with wire and j-clips and a couple zipties for areas that were hard to reach. the container kind of opens at an angle (so you can stack them,) so the cage sinks down about three inches or so. this way he's up off the litter, keeping him clean, with 'pee guards' keeping everything contained. it's not beautiful but it's so far the best thing ever for us haha. i could probably remake it and make it look nice, but considering how dry my hands were afterwards, i'll wait til it falls apart first haha. the dimensions are something like 27" long and i think 18" wide, so it's a decent size for a rabbit his size to just stay in, but he does have a "play pen" area he can access 24/7 that is just one of those open puppy kennel things. i would go for one of those if you want a play area. they're really heavy so they aren't easily moved. my little guy doesn't even try, but i have a couple of my larger rabbits that will push it, but that depends on your bun haha. but generally the heavier the better. Ferret.com also has prevue and marshall cages that are big names for high quality small pet and bird cages that are all still cheaper. They also have wabitats but I don't think any are over 3' with no potential for levels if you want lots of space. Not nearly as cost effective for the 2x3' space with 2' height you get in a ferret nation module and the plastic pans still break down faster than a steel frame cage you can just swap the pan out of for longer than the lifespan of multiple rabbits but I do have several of the plastic bottom marshall cages I was using indoors only for guinea pigs. Personally for a single rabbit I just coat some plywood in rustoleum enamel and grab some small corner brackets to make a custom depth and size cage usually 4-6' long and 8-10" high bottom. Then run shelving panels (hardware store will cut them here) or you could use any hardware cloth but I can only get thin stuff locally that needs a frame to hold shape well. 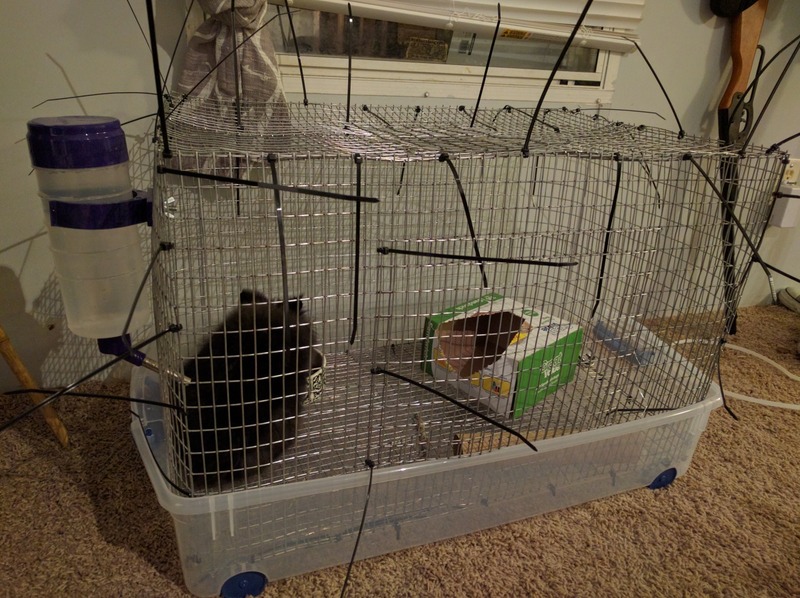 It's worked for guinea pigs, hedgehogs, reptiles, rabbits... it does need a metal rim (wire or you can get long hinges to run down the edge) for things that chew and I never tried that with chinchillas over the ferret nations because those things freaking eat aluminum so they all have steel cages with steel pans. Downside being you can't carry them in and outside but I don't provide outdoor cages for indoor animals. Just stick some shelter boxes in the pens and pens that make a full circle or rectangle will be sturdier. Pens need fastened down and supervised if they are that style. There's no way around that because rabbits can lift things and they are diggers. I watched someone that recorded their rabbit on a harness and leash tied to a stake dig a tunnel they could not measure past 8' in less than an hour. I had a mini rex go through plywood and compacted crushed limestone floor to make a tunnel I couldn't reach the bottom of sometime between 4am and 9am. If they want they will be out of any commercial pen in minutes. The heavy ones for dogs are slightly better but most make their own in the style of tractors originally started to contain chickens with wire lining the entire ground. For permanent locations people will bury wire or if it's a larger pen put in a wire skirt so they have to dig farther to get out and catch them at it before they escape. Any pen for setting with a pet cage is likely far too weak without modification. They might contain guinea pigs but even then I stake them down. I'd never stick rabbits in those weak open bottom pens for any length of time I am not there and it doesn't need an attached cage then. Best thing I ever invested in for my rabbits. Affordable and sturdy. Not as pretty as the attached pen in the link you provided, but can be attached to your rabbit's cage just as easily. All my cages came from K&W.... great equipment at a reasonable price.